Is there a way for me to test my forms without having my test submissions applied to my monthly limit? Thank you for your reply. I'd like to suggest that this be modified so developers can test without those tests being applied to the quote. You are certainly not the first to suggest this and will not likely be the last either. It may be a tall order for our developers but perhaps they can devise a way for the system to identify certain submissions as just tests and not have them be counted against allotted quotas. But getting back to the "reserved strings (Words)" idea, the "noCountAgainstQuota" function should only be triggered if all of the fields (except Email, for the reason already stated) contain only the reserved strings for the respective fields or nothing. 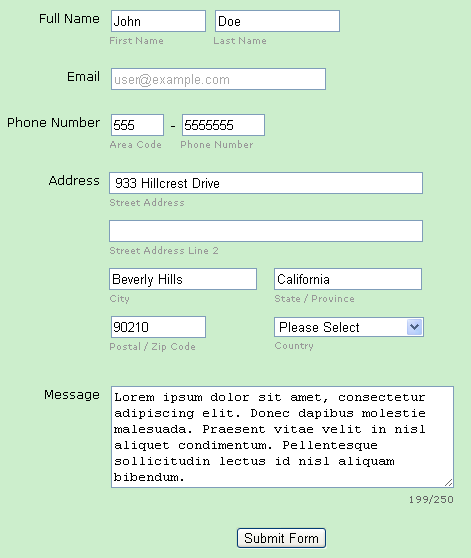 Combo fields like Full Name and Address would be special: In the case of the Full Name, John must be entered in the First Name input and Doe in the Last Name. For instance, it cannot contain "John Brown" or "Jane Doe".